To check your personalized exam schedule, consult your uoZone account under the Applications tab. Hard copies of any allowed materials for open book exams. 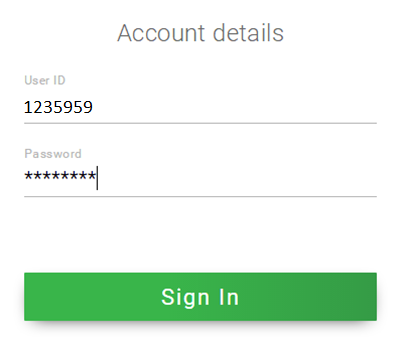 Your login and password for Examplify. Please arrive no later than 15 minutes before the exam time. Students will not be allowed in the classroom until the set-up is complete. If you arrive late to your exam, no extra time will be granted. Students who arrive more than thirty (30) minutes after the examination has begun will not be allowed to write the examination. Students writing the exam manually will sit in the front of the room. Show your official University of Ottawa ID card to the invigilator in order to sign the attendance sheet. It is your responsibility to bring your identification card to each exam. If you have lost your student ID card, you need to obtain a new one before the start of the exam period. If you don’t have your identification card, you must go to the Common Law Student Centre (FTX 237) before the start of your exam. Plug your computer into a power outlet. Please ensure that all electronic devices are turned off and put away in your bag and placed on the floor. In accordance with University regulation 9.4 and Faculty regulation 5.2, students are prohibited from using electronic devices or any other communication tool that has not been approved beforehand. The only electronic device that has been approved by the Faculty is a laptop when used in conjunction with the ExamSoft Examplify software. Listen carefully to the instructions given by the invigilator. Do not start writing or typing before instructed to do so. All students will be given a paper copy of the exam questionnaire and exam answer booklets in the examination room. Exam booklets should only be used to manually write exams, if you do not manually write your exam do not use an exam booklet. You may write the required information on the cover page (1st page) of your exam booklet during the preparation period. However you may not open nor write in the portion of the booklet reserved for exam responses until the proctor signals the start of the exam. Please note that software users will be required to hand write their exam if technical issues cannot be addressed successfully (in 5 minutes or less). Extra time will not be granted for time spent resolving computer failures once the exam has started. Academic regulations pertaining to exam invigilation and academic integrity apply equally to hand writers and software users. Please refer to Rule 5: Invigilation of Examinations and Rule 24: Academic Fraud. If you are taking a computerized exam please consult the Guidelines available in the Guidelines for Computerized Exams section below. Absence from any examination or test, or late submission of assignments due to illness, psychological problems or exceptional personal circumstances must be justified; otherwise, students will be penalized. Please contact the Equity and Wellness Counsellor. Students must contact the Common Law Student Centre as soon as possible and, if possible within twenty-four hours of the examination to be deferred. For additional information on deferral of examinations please consult rule 7 of the Academic regulations. Take a few minutes to learn about the University’s Policy on Academic integrity and Academic Fraud. It is your responsibility to familiarize yourself with our Academic Regulations. Information on take-home exams is available on the Common Law Student Centre website, on the Exams page. When major events or incidents (severe storms, fires, etc.) occur that result in the campus being closed and exams being cancelled, notices will be posted on the University home page, in uoZone and elsewhere on the University website, and will be recorded on the Emergency InfoLine (613-562-5555). For information on other special circumstances, see the Procedure on cancellation or postponement of exams. SILENCE IN THE HALLWAYS IS REQUIRED AT ALL TIMES DURING THE EXAM PERIOD. 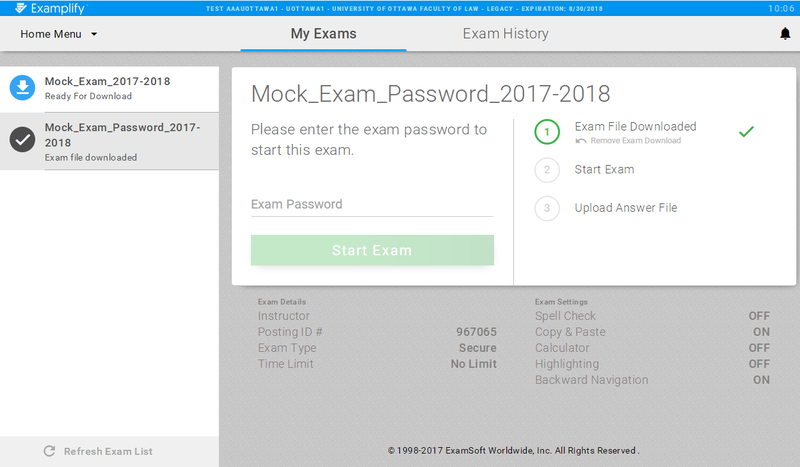 The Common Law Section offers the opportunity to write computerized exams in selected courses using the ExamSoft software, Examplify. This application allows students to use their personal laptops to complete their exams. In the instructions below, you will find information on how to install and use Examplify. Please note that the use of Examplify optional. For a list of courses offering computerized exams, please refer to the Exams Timetables. The user licence fees for an academic year (Fall, January and Winter terms exams) are $25 USD. Students opting to do one or multiple computerized exams will be prompted to pay the fees when registering for the software. 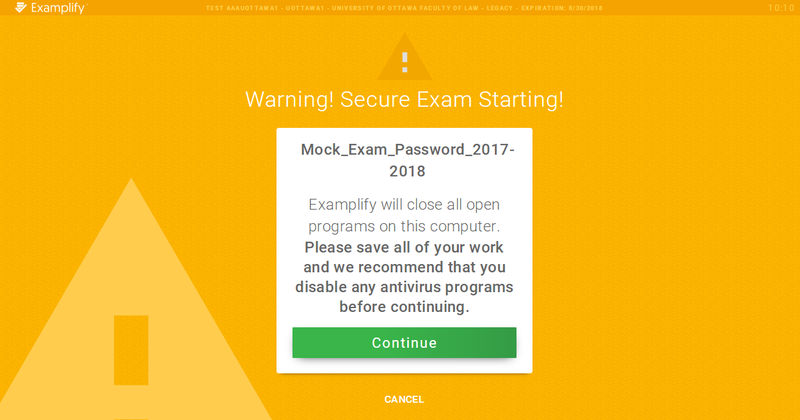 If you are registered with SASS - Academic Accommodations, you may choose to write your accommodated exams using the Examplify software when the computerized option is offered in a course. However, please note that this software is not an adaptive exam measure. If you wish to use Examplify, please note that you must inform the Equity & Wellness Counsellor. The deadline to confirm your intentions will be communicated to you before each regular exam period. For the Fall term exam period 2018 the deadline to confirm your intentions to use Examplify for an exam written at SASS is November 12, 2018. For exams taking place outside of the regular exam period, you must confirm your intention to use Examplify no later than 10 days before the exam date. We must be aware ahead of time to ensure your additional time is correctly allocated and that a laptop-compatible space is reserved for your exam. Please contact the Common Law Student Centre or the Equity & Wellness Counsellor should you require additional information. Do not use a small Notebook or a tablet / Ipad for your computerized exams. Step 1: An email will be sent to your uOttawa email account with login and password information. Step 2: Download Examplify on the Faculty’s Examplify portal. 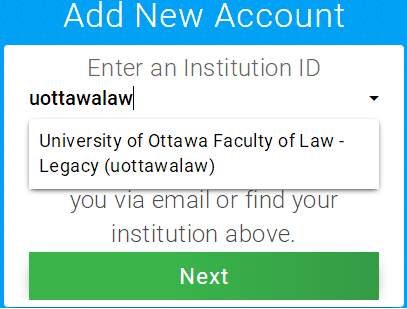 The institution ID is uottawalaw. Enter the user ID (student number) and password you were given. You will be able to reset your password after the initial login. DO NOT FORGET TO BRING YOUR PASSWORD TO THE EXAM. Practicing Examplify: Once Examplify is installed and registered, familiarize yourself by downloading and taking a Mock Exam. Remember it is your responsibility to familiarize yourself with your computer and Examplify. We recommend that you take at least one Mock Exam before each exam period. Check for sufficient free hard drive space on your computer. Verify that your current version is compatible with Examplify. Ensure no automatic updates are scheduled during the period of the exam. Check the computer’s time and time zones are correct. Select the correct language settings. Ensure that your computer is virus-free. Check for the latest version of your anti-virus. If more than one antivirus is installed, make sure to disable / uninstall them. For Microsoft users, please note that Windows 8 and later versions contain a built-in anti-virus, Windows Defender. All Antivirus software must be at least temporarily deactivated for the period of the exam, anti-virus mayt block Examplify or prevent the software from functioning properly. Ensure that you have enough battery life for the duration of the exam or that your laptop is plugged into a functioning power outlet. Exam takers who are not comfortable with the software before or on exam day can still decide to handwrite their exam. For each term, prior to your first day of exams, download the complete list of exams on your laptop. You will receive an email when your exam file is available to download. A confirmation check mark will notify you that the download has been successful. Hard copies of any allowed materials to open books exams. Arrive to the exam room no later than 15 minutes before the scheduled exam time. Typists will sit at the back of the room, hand-writers at the front of the room. If you arrive late to your exam no extra time will be granted. Please note that software users will be required to handwrite their exam as soon as technical difficulties occur. Extra time will not be granted for time spent resolving computer failures once the exam has started. Academic regulations pertaining to exam invigilation and academic integrity apply equally to hand-writers and software users. Please refer to Rule 5: Invigilation of Examinations and Rule 24: Academic Fraud. Double-click the Examplify icon on your Windows Desktop or single-click the Examplify icon from the Applications folder or Dock on your Mac. Locate the scheduled exam in the list. Enter the exam password. It will be announced verbally by the proctor and written on the blackboard of the examination room. Click on “Start Exam”. Please note that this password is case-sensitive and will need to be entered exactly as shown). If you are ready to start, click on “Continue”. Please note, this is the last screen where you can click on cancel and exit the page and return to the list of exams if you have chosen the incorrect exam. 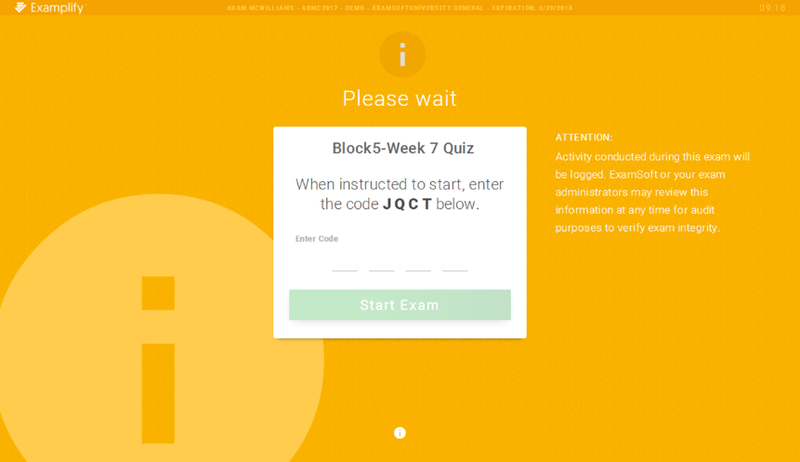 Once you have been instructed to begin your exam enter the code displayed on your screen and click the green Start Exam button. Please note that activity conducted during this exam will be logged and your exam administrators may review this information at any time for audit purposes to verify exam integrity. Once you have completed all the questions, you can exit the exam. Open the Exam Controls option, and select to Submit Exam. confirm, select the check box that you are ready to upload the exam file and click on the exit button. If the upload was successful, you will see a green confirmation screen. 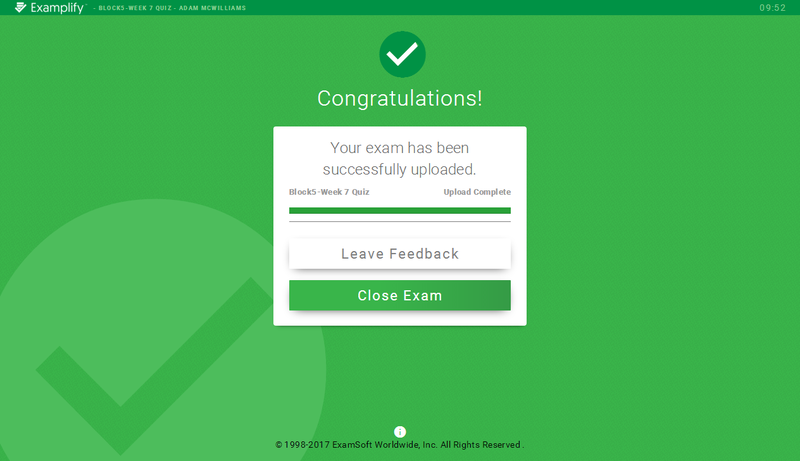 Once you have reached this screen, your exam has finished and you will not be able to return to this exam. Uupload your exam answers, immediately after the exam. Do not leave the exam room until your exam file has been uploaded. The penalty for continuing to type or write after you have been instructed to stop typing or writing and to close your exam is to subtract 10% of the value of the examination from the student’s grade. THIS RULE WILL BE STRICTLY ENFORCED. At the end of the exam, the invigilator will circulate the class list and you will be required to sign out and indicate that you wrote a computerized exam in the appropriate column. You must also submit the exam questionnaire. Please note that you will not be permitted to leave the exam room until these steps have been taken. 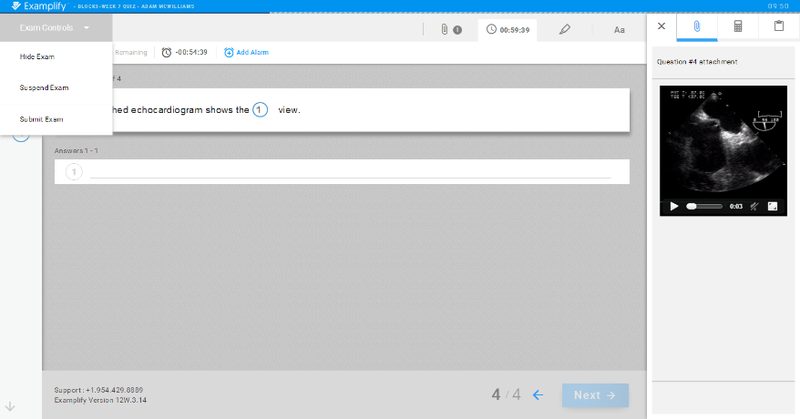 If you do not have an internet connection after you submit your exam, you will have to close Examplify, acquire an internet connection and relaunch Examplify. The exam file will upload automatically. You will receive a confirmation email for each answer file you upload. Some email providers delay or block emails considered as spam. If you fail to receive your confirmation email, it could be due to your email server. Remember to visit your Exam Download/Upload History page to confirm your answer file has been uploaded. You should not delete exam answer files from your laptop until all grades are posted at the end of the year. Should you have questions before or after your exam, ExamSoft offers live customer support via phone, email or chat. Students who encounter technical difficulties while installing the Examplify software should contact ExamSoft technical support directly at toll-free 1-866-429-8889 or support@examsoft.com. For quick and convenient answers to your questions, please visit the Examplify Support Webpage. To apply, you must use the following online tool Online Scholarships and Bursaries. The online application will be available as of November 15, 2018. The deadline is December 3, 2018. This bursary aims to financially support a student at the Faculty of Law, Common Law Section of the University of Ottawa who has demonstrated a financial need, and who has paid the license fees for the Examplify software by ExamSoft to take the computerized exams. Students that qualify for the bursary will receive a CAD$30 credit on their uOttawa student account. The Common Law Student Centre will verify that each student eligible to receive the bursary has downloaded the Examplify software before receiving the funds. Your personalized exam schedule is available via your uoZone account: under the Applications tab, click My exam schedule. Please note that exam details for some courses have yet to be confirmed. Please be sure to review the exam timetables again immediately before you enrol in courses. No accommodation is provided for exam timetable conflicts and it is each student's responsibility to ensure they do not have any exams scheduled simultaneously. The list of available exams is updated as they are received by the Common Law Student Centre. You have the possibility to review your final exams during the exam consultation period after the official grades are released. Please consult the list of final exams available for consultation at the Common Law Student Centre. If your final exam is not listed on the list, please contact your professor directly in order to schedule an appointment for an exam consultation. If your exam is listed on the list, you can schedule a consultation appointment through The Source, to review the exam at the Student Centre (FTX237). The appointments will be for a period of a half an hour only. You may take a second appointment if necessary. Please note that professors may not indicate any comments on your exams/assignments and will not provide any correction grid. Please consult the guide to Common Law section Grade Review Process. Please note that we have reserved the Computer lab located in the Brian Dickson Law Library for all the take-home exam dates. The exam questionnaire will be available in PDF format via Virtual Campus on the day of the exam. You do not need to pick up the paper copy of the exam (i.e., you can work from the electronic version of the document). If you experience difficulties with the electronic version of the exam questionnaire, please contact your Professor by email. All students must submit their answers electronically via Virtual Campus. The login information which is necessary to install and use Examplify will be sent to your uOttawa email address in the weeks before the exam period.